Today I had the privilege of attending the Sustainable Development Goals Forum at Sasana Kijang, and it is interesting to have a different perspective to the idea of Islamic Banking. I have always had the impression that Islamic Banking is the means of reaching the Maqasid of Shariah (objectives of Shariah). However, listening to the forum, I realise Islamic Banking is probably only the START of the journey to the Maqasid of Shariah. 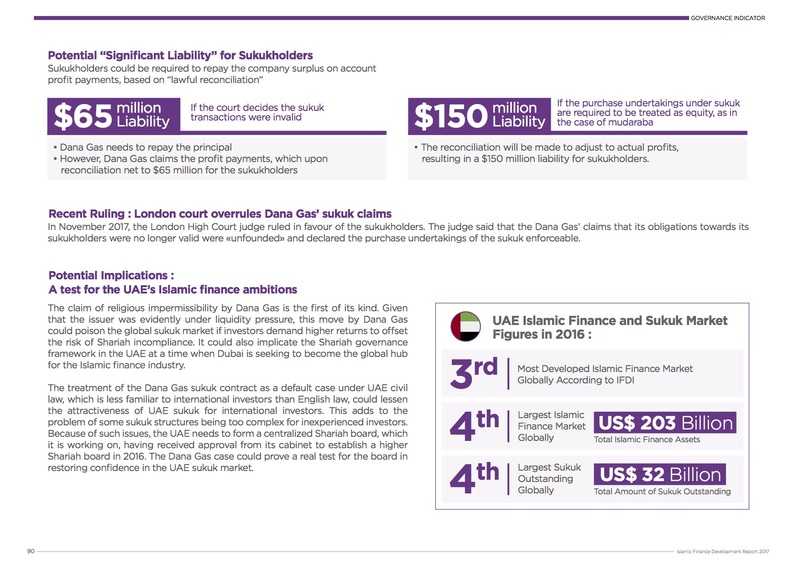 Are the funds deployed by bank used to finance Shariah compliant activities? Are the transactions valid and follows the minimum tenets of the contract? Are the processes following minimum Shariah requirements that avoid Riba (usury), Gharar (uncertainty) or Maisir (Gambling) elements? Are the features of the products and services resulting in justice and fairness to the customers? Are the products and services deliberated and assessed by the Shariah Committee to be in compliant to Shariah law and its veritable sources? A lot of banking activities aims to comply with “Shariah requirements”. However, this is a snapshot of just one portion of the whole Islamic value chain, which simply looks at only the part where the bank’s processes and practices satisfy the minimum requirements to ensure transaction validity. This makes the process “Halal”. But is being “Halal” enough? In a Muslim’s daily life, many aspect revolves around “Halal”. In particular we prefer Halal food, which means the food is prepared the right way according to Muslim traditions, which excludes liquor, un-slaughtered animal meat, and pork or lard. In the banking proposition, these are Riba, Gharar, Maisir and unjust practices. But these are still within the control of the banking institutions. Avoiding these, surely Islamic Banking practice equals Shariah compliance. But is merely being Shariah compliant sufficient to meet the objectives of Shariah? Halal, in my view, only corresponds to the minimum requirements in meeting Maqasid of Shariah. Stopping at “meeting Shariah compliance in terms of products, services, and operational requirements” does not necessarily satisfy Shariah in a larger worldview. One of the reasons of why I posted the picture of the Sustainable Development Goals (SDG) by the UN is that business activities should also take into consideration the environment in which it operates. The idea is to practice the business in a way that it provides a “Social Impact” to the community in particular and even for the country. Using propositions such as SDG provides a starting point beyond just “Halal”. It talks about taking responsibilities and accountabilities to the local community to ensure that the product on offer are not just “Halal” but also helps the community with meaningful improvements. This is where “Sustainability” suddenly moved to the forefront. The idea is not new. It has gone through various incarnations, and the more popular terms are Ethical Banking, or Sustainable Banking. These ideas however, are still very much internal arrangements, but rarely a view of the whole value chain. The idea is that not just being halal, but also being clean, fair, compassionate, helpful, and humane. This is where the objectives of Shariah can be met. A fair illustration of the above (which I picked up at the forum and it is a good one) is the conditions of rearing chickens. You have a chicken farm to supply chicken to your area. You supply the chicken which have been halal slaughtered and as far as your are concerned, you have met the “Halal” requirement ie slaughter in the traditions of Islam. But how about the value chain of chicken rearing? Yes, the minimum requirement is met i.e. halal slaughter, but the end-to-end practices in this single transaction have not been looked at. Will it meet the standard that will be imposed by Shariah if they are made aware of it? Let’s look at the value chain of chicken rearing. If the chickens are kept in cramp places with diseases, is this considered acceptable under the objectives of Shariah? If the chickens are fed continuously with pellets containing growth hormones and antibiotics, is it ethical in the eyes of Shariah? This is where Sustainability comes into the picture. There is a word that can aptly fit into this : “Thoiyyib” which means “pure”. A bank should look at the whole value chain of things to then decide whether a business activities is only “Halal” or “Halal + Thoiyyib”. This should be the new standards, when we think about achieving the objectives. There are many propositions on Sustainable practice which banks and customers can take cue from and develop further. Incentives to companies that adopt sustainable practices should be given, as sustainable practices are meant to be more humane, fair, just and gives bigger social impact than just being Halal. It is a skeleton than supports the whole community in sustainable activities. This includes concepts such as environmental friendly, non-polluting disposal, good waste management, people inclusion to jobs and equal opportunities, providing safety and security to communities, involvement in clean / renewable energies, and also providing education and equality in pay and relationships. In my view, achieving “Sustainability” is a bigger challenge to overcome. But the rewards can potentially be bigger, as all institutions in the value chain become less “profit driven”. There are too many elements to choose from, and it is expected to take years to achieve. There will be cost to implement this but there is a need to rely on the well-being of the overall community for you to potentially profit. Choosing sustainability suggest choosing positivity, and continuity. These concepts are also covered under the Value Based Intermediation (VBI) initiative that is promoted by BNM. Click link to see the Strategy Paper for VBI. Making the jump from Halal to Thoiyyib takes political will and commitment as well as collaboration with all parties in the value chain. Some sacrifices are needed as there will probably be some costs to the processes. However, with clear objectives to be met, being Halal cannot be the end-game. “Halal” should now just be minimum requirements, but can we be bold enough to take the next leap to take banking beyond Halal? Your scope of business : What is your business and industry and more importantly, what’s the potential for your business to grow? Is it a sunset industry or emerging business? What is the long term outlook of the industry? Your credit standing and payments conduct : How strong are you financially? Is your business reliant of project or is there continuous flow of business? Is there any issue in collections and payments? What is the payment track record? Is the Bank able to obtain evidence of your businesses credit strength via Audited Financial Statements, Bank Accounts, Invoices records and any other documents? Your collateral : Is your business able to provide any form of collaterals that is acceptable to the Bank? What is the valuation of these collaterals? Is there a secondary market for the collateral and what is the likely protection towards the Bank’s capital? These are all the tested ways of traditionally assessing your credit worthiness or financial viability. 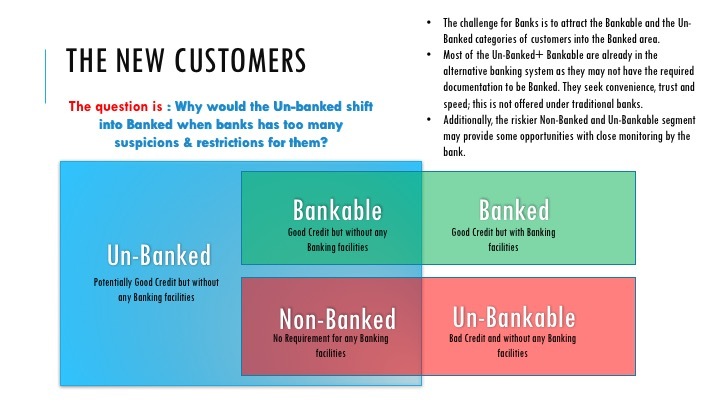 These are what Banks call you if you qualify: BANKABLE CUSTOMERS. BUT WHAT IF YOUR BUSINESS DO NOT HAVE ANY OF THE ABOVE? So now, you don’t have any or some of those, or you never really cared. You are a small business, with young people running it, utilising tech as your business platform. You source your materials and goods directly from suppliers, shipped to your home (or just resides at supplier’s premise), advertise on FaceBook and Instagram, and receive your orders online. You shipped them out to your clients via DHL or any decent courier service, and all your payments and receipts are done via epayment. Business is good and you want to grow. You seek a financing facility with the Bank. But the Bank promptly tells you : Your business is no good because you don’t fit the criteria that Banks have for their “target clients”. No track record. No financial statements. No collateral. You are officially UN-BANKABLE or UN-BANKED. WHERE DO THE UNBANKED GO, THEN? As much as the Banks like to think that the only way for your business to grow is to comply with the requirements to qualify for a banking facility, you have discovered that it is not necessarily so. Many have managed to grow without going through the banking red tape; in fact they avoid the Banks altogether. Options are starting to emerge to help you build your business, and most of them are not even Banks. Is it a scam or a money-game fly by night operation? Dare you take the risks? But it seems that they are willing to take a risk on your business, and since there is little other options, why not give it a try. The banking world is ultimately changing. We hear all the new words being used; Fintech, Bitcoin, Ethereum, Blockchain, Crowdsourcing, Crowd funding, Big Data, Antminers, Challenger Banks, Venture Capital, Seed Funding, Angel Investors, Digital Banking, ePayments, eWallet, Mobile Banking, Apps Banking, Tribe, etc. All these new “non-banking channels” appeals to a different type of customers; ones that understand technology and has a lot of trust in its capabilities. I agree with the view that the form of traditional banks must change in 5 years time to offer products and services that’s totally different from what we have now, reaching out to a wider group of Gen-Y and Millennials. But how do we attract such emerging generation whom are now glued to their mobile devices? This is where the Social Economy will be prominent. Just as the ease of the social media connects the Gen-Y to everything quickly and effortlessly, the new generation will not subscribe to the old tedious banking model. It will be about conveniences, and life which is more online 24/7. And if they are not able to obtain a required facility, they will be more likely to look at their own community for support, or else “Do-It-Yourself” solutions which taps on the fintech, internet or mobile infrastructure. They will become Digital Entrepreneurs, and Banks have yet to create a space for these young tech-savvy entrepreneurs to occupy. While the banking industry continue to develop traditional Islamic Banking products and services, there are many small initiatives that has taken the practices of Islamic Banking (knowingly or unknowingly) and made it into a viable business model. Even now we have real life example such as EthisCrowd.com that’s able to raise funds within 45 days for affordable property development projects to complete within 1 year via Mudharabah arrangement; this basically means there is no longer a need for banking institutions as a source of funding. And ironically, some of these alternative banking models are so aligned with Islamic Banking principles, and borders more of “socialism” more than anything else. The desire to “share risks” and “support the community” and “fund a worthy cause” moves the financial model away from “money making” and “return on investments” that we often associate “banking” with. This smacks familiarity with what the Islamic Banking industry has been created for in the first place; the realisation of Maqasid Sharia. Even Musyarakah (partnership) structures are already at work, where risk sharing translates to appropriate risk rewards for investors. This is also a relevant to the idea of Investment Account where the sources of Mudharabah funds are used to finance a project directly and returns are based on actual performance. Equity financing (as per my previous month posting on Dr Daud Bakar’s commentary on Profit Loss Sharing) is already being practiced by non-Banks, thus begging the question whether a Bank can really be as effective (or quick) to support equity-based structures as a non-Bank initiative. While this is yet to be a mainstream phenomenon but do remember as the Gen-Y and Millennials grow up into the bankable space with credible financial strength, their views of what banking should be may be far different from what we think it is now. Challenger Banks. The funding structure offered by these non-bank entities may/may not be based on crowdsourcing or crowdfunding. These essentially can be arranged as a Mudharabah (profit sharing), Musyarakah (partnership), Wakalah (Agency) but without the regulatory shackles. The question is on the rights and warranties for the crowd. Extra due diligence may be required but it should not be a tedious process. Otherwise, the crowd will see this as just another “banking” entity which they wanted to avoid in the first place. Online Payments & Mobile Money. A key part of the process where the transactions may by-pass regulated banks and go straight from Peer to Peer (P2P). All online payment structures will be validated via blockchain infrastructure, at the fraction of a price and even faster speeds of transaction. Shariah will also be interested in the sequencing and the process flow and issues of ownership of the cash when it is done at the blink of an eye. I admit all of these are still new terminologies and understanding to me, but it represents such a huge opportunity to rebuild the industry on the right footing, learning from past mistakes, taking the best practices from non-Bank models and moving away from simply debt-financing. It is an exciting world that is still evolving, and will be driven by the new generation so comfortable with technology, community and convenience. The banking model must change to meet this reality, the question is how to also get the Shariah elements into the various key processes. There is no better time to incubate this. Especially in the Islamic Banking space of equity-based structures. Welcome to the new world, and it is a big world out there. Many months ago, there was this posting by Dr Daud Bakar, CEO of Amanie Group and Chairman of Shariah Advisory Council (SAC) of Central Bank of Malaysia (BNM) where he stated Profit Loss Sharing (PLS) structures are not suitable for Islamic Banks. It caused quite a stir in the market as there have been a lot of push by Shariah circles on Islamic Banks to develop Islamic Banking products based on PLS. People were surprised that such comments were made by the Chairman of SAC, when BNM have been active in pushing Islamic Banks to develop these very contracts. So what is the story then? Do we want to see Equity Products such as Mudarabah or Musyarakah Financing in the market, and is it feasible as a business model under current banking structures? As much as I want to say we are ready for it, the reality is that there are other considerations where offering these financing products is maybe not the right fit for Islamic Banks. We may attempt to develop them nonetheless, but we have to be wary of the requirements set out in the Policy Documents and comply with it. As I have written before in Disruption Islamic Contracts the industry is entering the era of Compliance rather than Innovation. If we were to develop for example Ijarah products, we will not be able to comply fully with the contract requirements (such as ownership risks and force majure), and Islamic Banks will opt for “easier to comply” contracts. The risks inherent in the contracts will also hamper full-blown development of such contracts into workable compliant structures. It is unfortunate; the Policy Documents issued by BNM are very extensively written but a challenge for Banks to fully comply with. And when you expand your intention to go into equity-based financing (PLS), the risks would remain with the Bank as these Islamic structures do not allow for transfer of risks from the Bank to customers. This greatly hampers Banks used to mitigating only certain types of risks, or in the best case scenario, Banks are only willing to introduce basic or safe-feature products, with a lot of legal mitigants to protect Bank’s interest. It is an uncomfortable territory for Banks where the issue of Banks holding “unconventional” risks cannot be satisfactorily addressed. Why do we need to discuss PLS? Our discussion are now becoming more relevant moving forward. In my view, traditional Islamic Banks and the way it was set-up, caters more for debt-based structures where risks are traditionally understood. The template used for building Islamic Banks was conventional banking. While we have “Islamised” the operations, systems, processes and products, the similarities between Islamic and conventional banks remains prominent. Leveraging on conventional banking infrastructure was a necessity. That is essentially what traditional Islamic Banking did. Replication, compliance, and competition. Needing a new Banking model. An Alternative Banking model. So if PLS is not the right fit for Islamic Banks, where can it exist then? I believe this is the right time and opportunity to ask this question of where PLS should thrive. With all this talk about Value Based Intermediation (VBI), Fintech, Investment Accounts, Crowd Funding, Private Equity, Venture Capitalists, Participation Banking and Challenger banks, perhaps the PLS structure should be the next inclusion into these discussion. The sandbox is open, and I sincerely believe this opportunity allows for the serious consideration to include PLS. The risk profile you see in these types of Fintech forums cater for a different thinking; banking the un-bankable, understanding of unconventional risks, investment into entrepreneurial ventures and community involvement in sharing of risks. 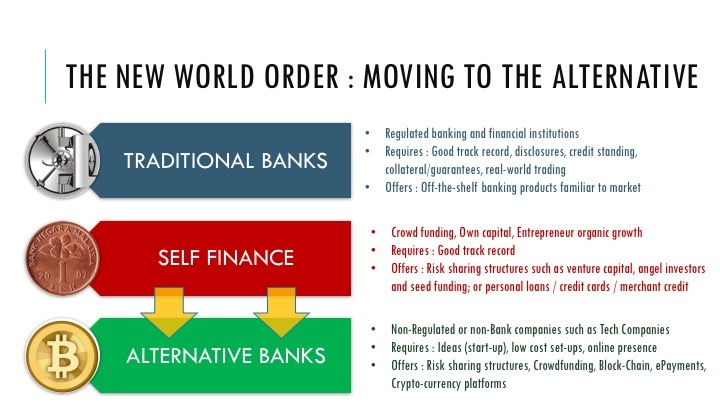 And more interestingly, most of the structures are already available in this “alternative banking model” and have significantly similar characteristics and behaviour expected from Islamic Banking practices. Especially on the sharing of risks and returns. It is something that interest me immensely. I believe the next wave in Islamic Banking must be in this new digital world where speed, access, and business model (without financial intermediation) forces a monumental shift in banking practices. As we are starting from ground zero, why not put PLS / equity-based structures / participative banking / as the focus for all these new developments? If not now, then when? Leave the debt-based structures with the traditional banks, where the familiarity with credit, collateral, sources of payment and audited financial statements will continue to drive traditional businesses. Let PLS force a re-think into alternative Islamic banking, where entrepreneurial ability, direct investors, sharing of returns, performance of business, risks understanding, speed, low costs, access to the un-bankable population, big data mining, and technology-driven solutions become the main priorities for development. There is little choice for us where change is now required. If change is needed, why not put PLS as part of the necessary change? The next wave must start. Watch this space. More on Fintech and alternative models soon. I am all about repositories. Simply because there is too much for me to remember when it comes to Islamic Banking and Finance. This website was borne right from such need i.e. to become my resource centre that I can share with friends, colleagues and general public. 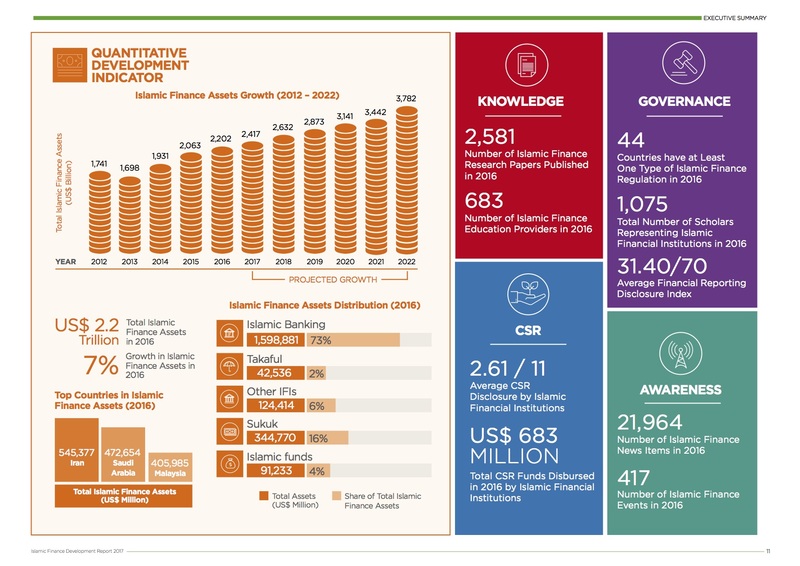 Coming across the efforts by ISRA (International Shariah Research Academy for Islamic Finance) to create such a repository under i-FIKR is commendable. 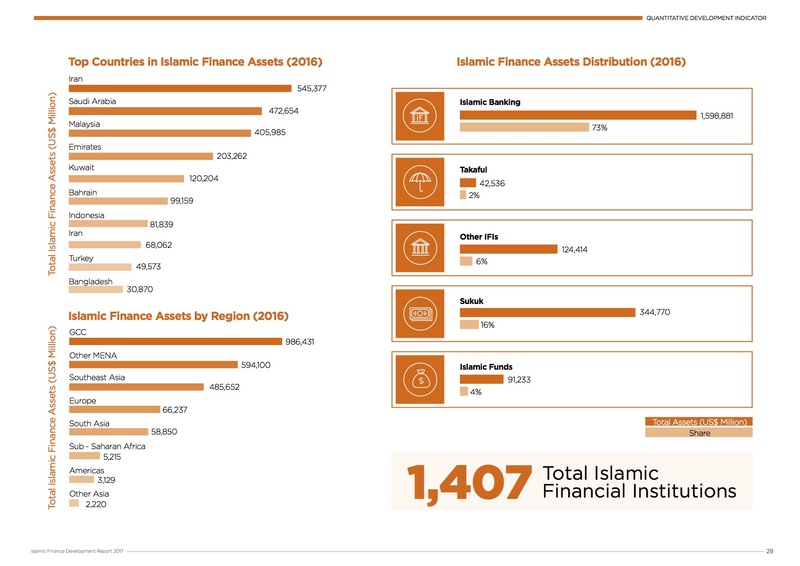 A quick look at the website gave me a sense of the wealth of contents available to those seeking resource materials for the on-going developments in Islamic Finance. For a small subscription fee, this will prove to be a valuable option for them. Also, download the publication of the Islamic Commercial Law Report 2017 by ISRA & Thomson Reuters here. Is There a Secret Book I Don’t Know About? 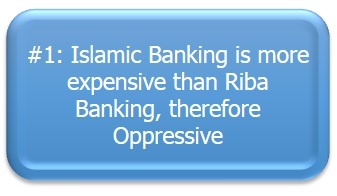 ISLAMIC BANKING PRODUCTS ARE EXPENSIVE? It is one of the mysteries of the universe that there is this perception that Islamic Banking products are MORE EXPENSIVE than the Riba products counterpart. It never fails to surprise me that in Malaysia, whenever I open the session for Q&A after a talk on Islamic Banking, that the question put to me was “Why is Islamic Banking financing products more expensive than conventional banking products?”. Honestly, I wondered if this question comes from the possibility of everyone reading from the same exact book published many many years ago, making that one point of contention again and again. Which book have people been reading? Can someone pass me this book? It seems everyone is reading or referencing the same book which says “Islamic Banking products are expensive”. Can someone tell me about it? So I decided to ask around. I asked the persons asking the question on why does he/she say that? In what scenario? Which product? What feature of the product makes it expensive? In all attempts, they replied “It is the general view that Islamic Banking is more expensive”. But they have yet to give me any evidence when I asked for their source. This is like a scary bedtime story that parents tell their children if they don’t behave. So now I am asking around for specific scenarios on why they made such comments. From what I gathered, these are some of what I think people are referring to. But I couldn’t be 100% sure, so please, do leave your comments and scenarios (and details) for me to evaluate and respond to. Because, for the past 20 years (in Malaysia at least), this claim of “Islamic Banking products are more expensive than conventional banking” are simply not true. Of course, before I delve deeper into this perception, there are differences in Islamic Banking that requires additional items or costs, but mainly these are operational costs or documentary costs or management costs which are linked to mainly Shariah requirement on Aqad. For conventional banking, it is just a loan agreement, For Islamic Banking, a trading transaction may occur, and if it does… there may be additional costs. But these costs are usually absorbed by the Bank itself, and hardly passed on to the customers. So why would it be more expensive for the customer, if the Bank is absorbing these “costs” as part of their cost of doing Islamic Banking business? And additionally, the costs borne by the Bank for doing Islamic Banking business are not significantly higher. The Bank have to remain competitive as well, either against conventional banks or other Islamic banks as well. So the costs, if significant, will not be passed to customers to remain competitive. It should be on par with other players in the market. Selling Price – In some Islamic Banking products, there are trading requirements (Murabaha / Tawarruq / Istisna’a / BBA) and one of the tenets of valid sale is that there must be a Selling Price. Selling Price is the sum calculation of all the Installments the customer has to pay over the period of financing. The formula is that Selling Price = Monthly Installment x No of Months of Financing. Once this is agreed, it cannot change; anything above and beyond the agreed Selling Price (maximum) is considered Riba. Conventional Banking products do not have this as they only declare the Installment amount per month based on prevailing rate. Truth is, no one really know how much they eventually pay under conventional banking product, because there is no capping of the amount they may pay. The tenure can be extended, the installment can be increased, the rates may be revised upwards under conventional banking. There is no control of how much (maximum) conventional banking can collect from the customer. If conventional banking products add up the installments over the period of time, they can also see the amount equivalent to a Selling Price ie total amount payable over the tenure. But they don’t, because it ties their hands from collecting more. So, is Islamic products more expensive? It is possibly the opposite i.e. cheaper than conventional due the maximum Selling Price compared to a conventional loan without any maximum amount (sky is the limit). Ceiling Rate – Islamic Banking products may work on either a fixed rate structure or floating rate structure. If the structure is a fixed rate structure, it looks similar to the above. If is floating rate structure, then there is a need to put up a Ceiling Rate (a maximum rate that Shariah allows us to charge) for the purpose of the Aqad, where the certainty of price is required. However, once the Aqad has been concluded (Selling Price is contracted), the day-to-day running of the financing is charged at the Effective Profit Rate (usually below the Ceiling Rate) which is reflective of the prevailing market rates. Which is what the conventional banking products are charging. This makes the actual amount paid for Islamic Banking product at par with conventional banking products. The difference between the Ceiling Rate and the Effective Profit Rate is not charged on the customer therefore given as a Rebate on price (Ibra’). 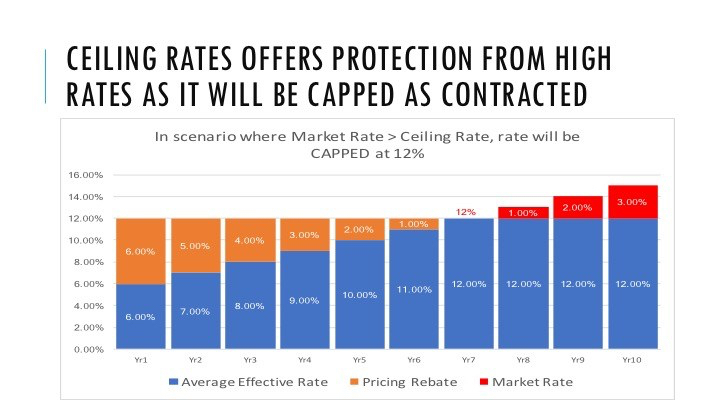 For example, if the Ceiling Price for the Aqad is 10% and the Effective Rate for day-to-day is 6.0% (ie customer is charged only 6.0%), then the difference of 4.0% is a pricing rebate to the customer. So, is Islamic products more expensive? No. It is on par after pricing Rebate. In fact, having a Ceiling Rate provides additional “protection” for an Islamic Banking customer i.e. during times of high volatility of Base Rate / Funding Rate, the Ceiling Rate serves as a rate protection for the customer. For example, should the all-in rate of the financing increase to be 13% or 14.0%, the customer’s rate will not exceed the Ceiling Rate of 10%, therefore saving the customer the excessive rate during periods of uncertainty. So, during period of high volatility of rates, the Ceiling Rate will not be exceed thus making the product cheaper than the Conventional product. 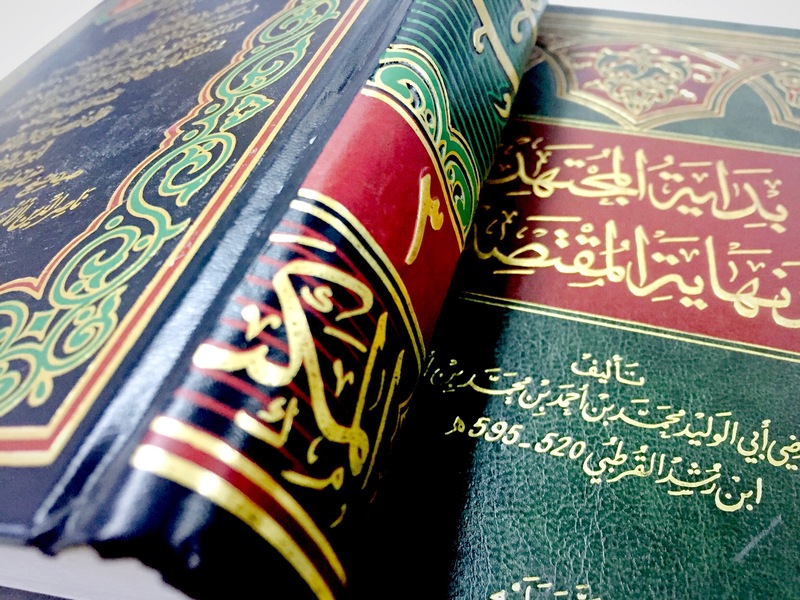 More Documents – I acknowledge that some Islamic products do require additional products as a package. But as for main documents, where the most charges are incurred including stamp duties, are usually the same as any conventional banking product. Maybe there are earlier perception that because of the Selling Price based on Ceiling Rate, the stamp duty will be more expensive. It is not true. Stamping will still be made based on the principal amount even for an Islamic facility. Furthermore, secondary documents are usually stamped at nominal amount i.e. $10 per document. The additional documents for Islamic product, if we assume requires 5 additional, will cost the customer $50 extra. That is not significant. So, is Islamic products more expensive? For documents, maybe. But it is dependant on structure and the additional documents will be stamped nominal value. Early Settlement Rebate – I probably understand and agree with this point, provided it was made 15 years ago! Traditionally, when a customer takes a loan with a conventional bank and want to do an early settlement after a few months, an early settlement penalty was charged. For an Islamic Banking products, when BBA was offered many years ago, the method was to give a “reduced discretionary rebate” on the unearned profit. This means maybe some Islamic Banks want to earn the same early settlement penalties (like a conventional bank) via a reduced rebate as rebates are by nature, discretionary in the eyes of Shariah. However in 2011, BNM issued a specific guidelines on the treatment of rebate for early settlement of Islamic sale-based financing products. The guidelines ensures that the rebate given is mandatory, with a specific formula to be adhered to. The guidelines also included the required disclosures for transparency purposes. In short, Islamic Banks cannot charge early settlement compensation (only a couple of scenario where it is allowed) and the rebate given must follow a strict formula. So, is Islamic products more expensive? There might be a case for this argument before 2010 (for early settlement cases only) but with the Ibra guidelines issued in 2011, the product would possibly result in at par or cheaper than a conventional bank product. Commodities Trading Fees – This is a recent phenomena. A lot of structures are riding on the popular Tawarruq structure, and this structure involves the buying and selling of commodities via brokers or established trading platform and there are Trading Fees being charged. Generally, for retail consumers, the trading fees are absorbed by the Banks; you will never notice it. But for Large Corporates dealing in hundreds of million deals, a trading fee may be noticeable. However, these fees are also deemed small enough to be ignored. The standard trading fees at Bursa Malaysia is $15 for every $1,000,000 commodities traded. That’s 0.0015% charge. For a $100 million transaction, the trading fee will only be $1,500. I have not seen any Corporate customers refusing to pay this trading fees. And there are some brokers who are even charging lesser rates. So, is Islamic Banking more expensive? Only for Tawarruq, there is additional costs but for the quantum, I do not believe 0.0015% is considered significant, or expensive. It really is testament that the men and women in the industry were always looking to enhance, resolve and improve on contentious practices to serve the public. The products were always evolving to be better for the consumers. In fact, I believe we are at the stage that some of the offerings under Islamic Banking is CHEAPER than the conventional banking products due to certain fees and charges and treatment on the account are instructed by Shariah Committee. IT IS A PERCEPTION THAT NEEDS CORRECTION. IT IS NOT CLEAR WHICH PART OR PRODUCT FEATURE THAT THE PUBLIC PERCEIVES AS MORE EXPENSIVE. IS IT THE RATE, THE PRICE, THE PENALTIES?. IS THERE ANY UNFAIR TERMS LEADING TO THIS PERCEPTION. COULD ISLAMIC BANKING FINANCING PRODUCTS ACTUALLY BE CHEAPER THAN CONVENTIONAL LOANS? In some scenarios, I do believe so. There are many areas that is governed by Shariah decisions formulated to protect or benefit customers for fairness. Especially in areas of fees and charges and compensation. IF YOU WANT TO KNOW MORE ABOUT ISLAMIC BANKING PRODUCTS BEING CHEAPER THAN A CONVENTIONAL BANKING PRODUCT, CHECK OUT MY COMING POST. I really hope someday someone will pass me this mystery book to read. We are in 2017 and so much have changed in the past decade. Huge and big regulations have been introduced and most of it with heavy input and consideration from the Shariah Advisory Council (SAC) of BNM. These are learned individuals that I believe are not greatly motivated by money. There are huge responsibilities on their shoulders thus the decisions made will be for the benefit of customers in mind. Again, I invite readers to provide me with the latest findings where it is believed that Islamic Banking is more expensive than conventional banking products. Let us discuss and evaluate them based on actual facts. 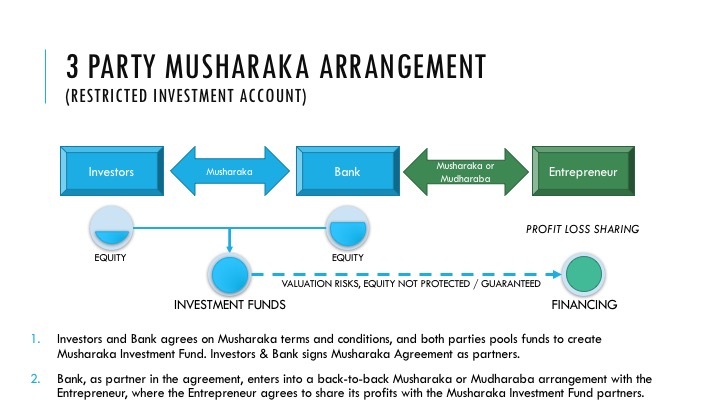 Recently I got a query from a reader in Macedonia on the Musharaka Financing model. A few questions which I feel are worth exploring to see if anyone have the viable answer. I have put up my responses in Islamic Banking 101. In my humble opinion, Musharaka Financing has its own place in the Islamic Banking world, but not necessarily suitable for the likes of traditional Islamic Banks. Banks, as financial intermediary, is essentially set up to do “banking business” and the scope of banking revolves around debt financing, where the risk faced by the Bank is predominantly Credit Risks. The Shareholders, and to the large extent the Customers, dictates the type of risks that they are will to undertake when choosing a Bank. The main intention of banking with a financial institution is to protect the value of their deposits, without taking excessive risks, and with the expectations of reasonable returns derived from low risks investments. Because of the above, the most suitable structures where Credit Risks is assessed are contracts such as Tawarruq (Commodity Murabahah), Murabahah, Istisna’a, Ijarah Thumma Al Bai (AITAB), Musawamah, Musharakah Mutanaqisah and Qard. The nature of these contracts are creation of an obligation between one party and the other, and because the above are based on sale or lease on an underlying asset, the risks are purely Credit Risks, and Interest Rate Risks. 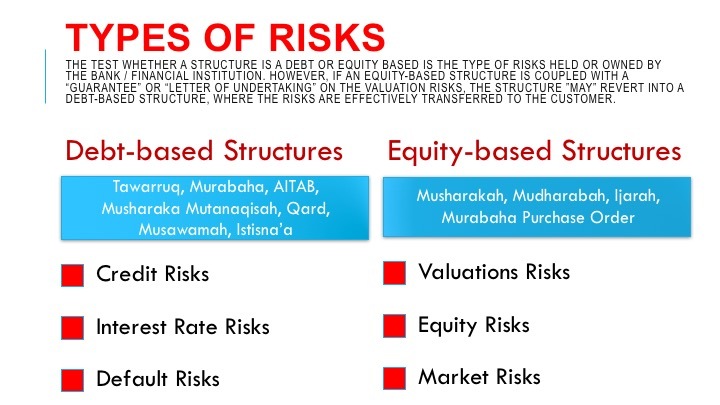 However, Musharaka and Mudharaba financing risks should be based on consideration of Valuation Risks, Equity Risks and to some extend, Market Risks (I also include Ijarah and Murabaha Purchase Order into this category). In essence, a Musyaraka refers to “equity partnership”, arriving from the word “Shirkah” or in Malaysia we commonly know it by the word “Syarikat”. It means, a group of investors pool their money (as capital), and jointly enters into a business venture as partners, be it finance or expertise for the business for the purpose of making a profit. A leader or manager may be appointed to run the business. All the partners agree on a profit-sharing ratio for profit they intend to share, and this is negotiated up-front based on what they contribute (money, skills or otherwise determined). However, this also means that the partners agree that any losses will be shared amongst the partners but limited to their capital contributions. As I mentioned, not many Banks are set-up to handle “equity-based” financing, as the risks are above and beyond the threshold a normal Bank is willing to take. The risky nature of the endeavour, and potential diminished Equity, does not bode well with many Banks. While it is difficult to offer these products directly from Banks, there are already initiatives by Bank Negara Malaysia to develop the product via a stand-alone platform, where Bank’s involvements are kept at a minimum and the platform acts as a direct link between the Customer (as Investors with Equity Funds) and Businesses (as Entrepreneurs seeking Equity) as partners. This platform is the Investment Account Platform (IAP) which was launched in 2015 and Shariah-Compliant. So far, the ventures listed in the IAP uses either the Musharaka Restricted Investment or Mudharaba Restricted InvesTment Accounts (RA). Further, the application of “equity-based” structures are limited in the banking world, as it must be able to manage “Investment Accounts” for the purpose of equity financing. Many Banks do offer this via Restricted Investment Accounts (RA) set-up, commonly known as Profit Sharing Investment Account (PSIA). This is a direct “equity financing” arrangement where the Investors (usually the parent financial institution, and the Islamic Bank itself) will provide a sum-equity to match-fund a particular project or financing requirement of the customer (entrepreneur). The Islamic Bank, in this case, also acts as a manager where it earns a “manager fee”. The risks and rewards of the Musharaka, is enjoyed together by the Investors under the PSIA arrangement. However, this structure is not offered to Retail customers, as the structure is designed to retain the “investment” throughout the financing tenure (no early redemption of the investment). 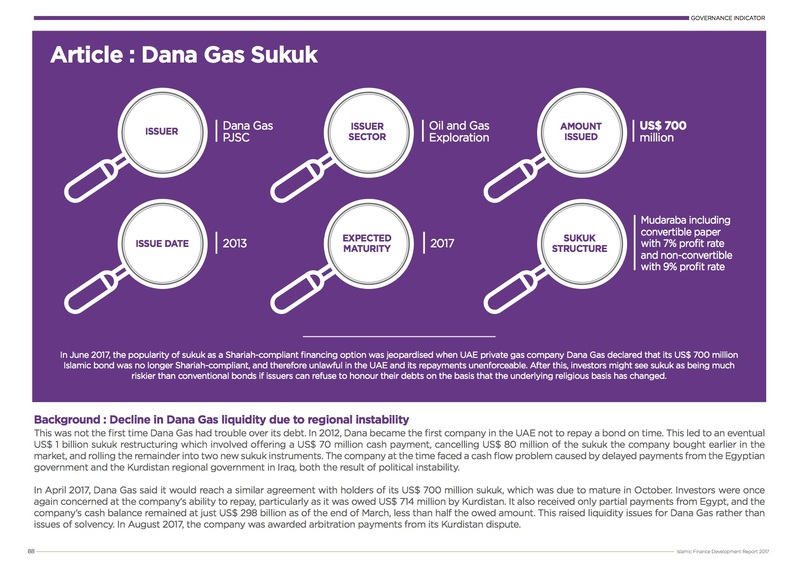 In short, there are already structures based on Mudharaba or Musharaka Financing that we can look at in the Malaysian market, although at this moment, many parties involved are threading with caution. It remains to be seen how successful these will be, but slowly the market would be able to understand the requirements for such products. Besides, these products and structures have been operating as Venture Capitalists (VC), Partnerships and Crowd Funding. It is a matter of operationalising it in the banking space, either in the existing Islamic Banks (which is highly regulated) or consider a totally new financial institution that is able to take higher “equity” risks, which promotes innovation and re-think the way we look at financing. 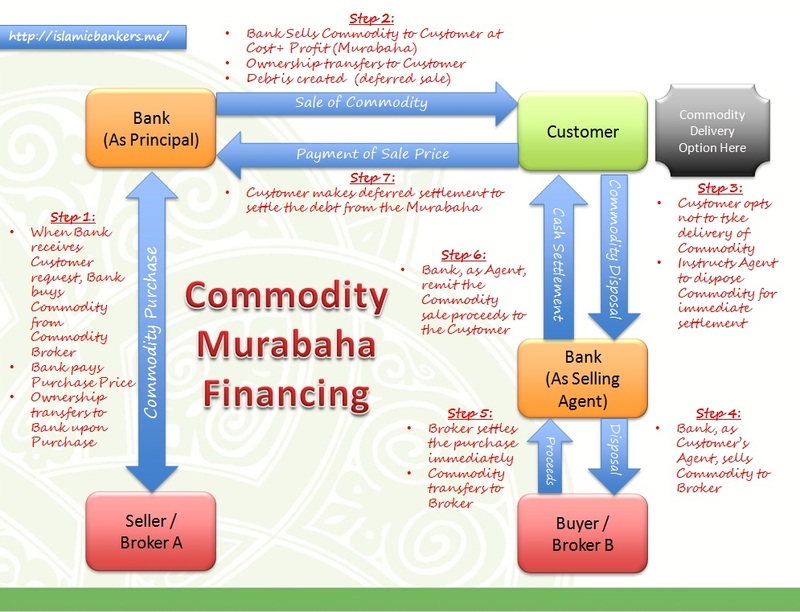 For an extended read on Musharaka Financing, please click on this link for Islamic Banking 101 on the topic. Note: Musharaka Financing is different from the often-seen financing Musharaka Mutanaqisah for mortgages.